Farmers markets are gaining a lot of traction in the United States, but they take time to plan and organize. Even when a farmers market has been installed, it can still be too far for some to get to. That’s why a project like ‘Veggie Mobile’ is so useful. A pair of farmers in Burlington, Vermont, grow organic vegetables and sell them (for wholesale or less) out of an old postal truck. The idea is modeled after those wonderful vehicles that sell ice cream during the Summer. 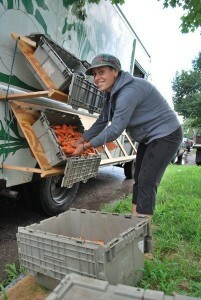 Mobile produce sales aren’t new to Burlington or any city. Decades ago, farmers would deliver fresh goods on a daily basis from a traveling cart. Sadly, the carts disappeared as food production gradually industrialized and automobiles became a way of life. Of course, some fuel is required to get the veggie mobile from place to place. But it’s not much more than it takes to get food to farmers markets anyway.